There’s something truly captivating about Australia…perhaps it is the mystique of the Outback where for centuries the Aborigines have lived, learned and endured a hard but fascinating lifestyle…or the dynamic atmosphere of its modern, bustling cities. Discover New Zealand…breathtaking fjords, rolling green hills and charming cities create a world of mesmerizing beauty. 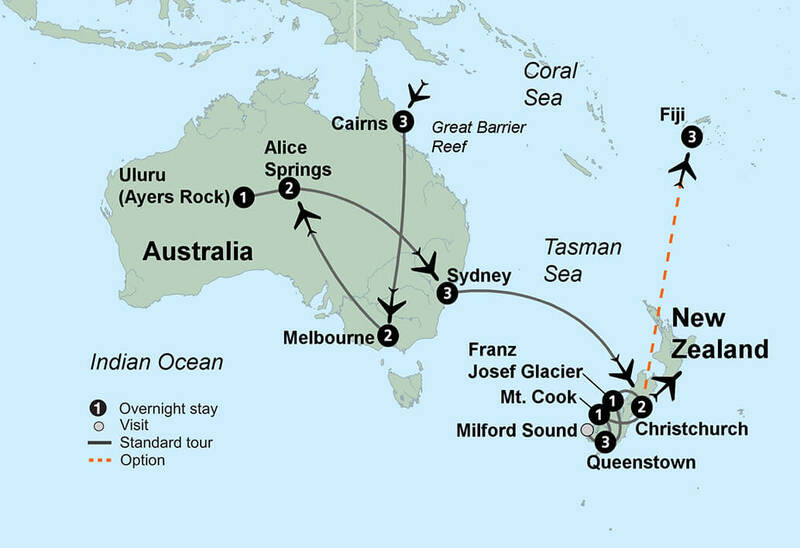 Board your flight and begin your adventure to Australia and New Zealand. You lose a full day crossing the International Date Line. (3 nights) Your tour begins today in Cairns, gateway to the world’s largest coral reef system. The Great Barrier Reef is not only renowned for its prestigious status as the world’s biggest single structure made by living organisms, but also as a World Heritage site. Meals Include: Dinner. This morning is at leisure. Perhaps you will join us for an optional tour on the Skyrail Rainforest Cableway for an unforgettable experience that takes you above the rainforest canopy for a bird’s-eye view of the unspoiled natural beauty that lies beneath. This afternoon, visit HARTLEY’S CROC FARM for a chance to get up-close and personal with crocodiles in their natural habitat. Boardwalks take you through rainforests and woodlands to see animals such as wild birds, reptiles and wallabies. While visiting you also have the chance to meet some of the local koalas and have a private talk with a wildlife naturalist to learn more about these cuddly creatures. Meals Include: Breakfast. Board a catamaran and sail to the Low Isles for an exciting exploration of the GREAT BARRIER REEF. During the excursion the choice is yours to either explore the shores of this small sand island on the outer reef or perhaps you would prefer snorkeling to see the vibrant sea life up close. You also have the opportunity to meet with a marine biologist during an informative presentation. Or you may also choose to join an expert for a beach and heritage trail walk along the island. Meals Include: Breakfast, Lunch. (2 nights) Fly to the beautiful Victorian city of MELBOURNE. Meals Include: Breakfast, Dinner. Today’s tour of Melbourne features Fitzroy Gardens, valued for their historic and horticultural significance, and the bustling “laneways” of Melbourne. Later, you may participate in an optional tour that travels to Phillip Island, a renowned nature reserve and home of the world’s largest colony of Little Penguins. Protected and studied by rangers, hundreds of them waddle out of the sea and cross the beach to their burrows in the dunes. At the interpretation centre, you have a chance to learn about the lives of the Little Penguins and their significance to the area. Meals Include: Breakfast. Begin your day with a Dreamtime Tour where your specialist guide shares stories of creation and everyday Aboriginal life. This afternoon, discover a more modern side to Outback living when you visit the Royal Flying Doctor Service, a lifeline to thousands across the vast terrain of Central Australia. Later, tour the Old Telegraph Station and Anzac Hill with its excellent views of Alice Springs and the surrounding area. Meals Include: Breakfast. This morning traverse the “Red Centre” as you drive to Uluru (the Aboriginal name for AYERS ROCK) in the heart of the Australian Outback. This huge monolith and the sandstone domes known as Kata Tjuta were created through the process of upheaval and erosion. Tour the base of “the Rock,” learning about its geology and significance to Aboriginal culture. Prepare for a truly majestic sunset as you witness the changing colours of Uluru accompanied by a champagne toast. Meals Include: Breakfast. (3 nights) This morning tour Kata Tjuta before saying farewell to the quiet of the rugged Outback. Then, fly to SYDNEY. Upon arrival enjoy dinner in the bustling Darling Harbour restaurant area. Meals Include: Breakfast, Dinner. During a city tour of Sydney, see where the original English colonists first settled in 1788. Highlights include KINGS CROSS, HARBOUR BRIDGE, CHINATOWN, THE ROCKS, CIRCULAR QUAY, BOTANIC GARDENS, and the fashionable suburb of Darlinghurst. Discover one of the world’s most fascinating architectural sights as you take a guided tour of the SYDNEY OPERA HOUSE, poised majestically on Sydney Harbour. Then you’re in for a unique experience as you learn firsthand about opals during a special presentation at the National Opal Collection. The rest of the day is at your leisure. Meals Include: Breakfast. Your day is at leisure for deeper exploration of the area or catching up on your shopping. This evening enjoy a DINNER CRUISE on beautiful Sydney Harbour during which you will be treated to spectacular views of Sydney’s greatest icons – Harbour Bridge and world-famous Opera House. Meals Include: Breakfast, Dinner. Leave Australia behind and fly to the historic city of CHRISTCHURCH. Devastated by an earthquake in early 2011, see firsthand how the “Garden City” is recreating itself during a sightseeing tour that highlights the city’s magnificent gardens and elegant park district Meals Include: Breakfast. Take in the marvellous snowcapped peaks and beautiful river gorges during your travels across the Southern Alps, winding your way past waterfalls and rugged mountains. You may choose to take the TranzAlpine train (optional) for a truly inspiring train ride through this glorious scenery. You will end your day in the Franz Josef Glacier Region which offers travellers a rare opportunity to experience a living glacial landscape in a temperate environment. Meals Include: Breakfast. (3 nights) Before departing Franz Josef, if the dynamic New Zealand weather cooperates, you may opt to see this beautiful glacier region from a bird’s-eye-view during a flightseeing tour. Enroute to Queenstown, watch as the amazing landscape unfolds before your eyes as you pass through the rainforest, bordered by the Southern Alps and the twisting coastline. Cross jade green glacial rivers, view thundering waterfalls and enjoy dramatic changes in scenery. After crossing the Haast Pass, arrive in QUEENSTOWN, one of New Zealand’s prettiest towns. Tonight, enjoy dinner overlooking Lake Wakatipu and the Remarkables mountain range. Meals Include: Breakfast, Dinner. Enjoy the rugged grandeur of the HOLLYFORD VALLEY as you travel through beech forest via the HOMER TUNNEL within Fiordland National Park to Milford Sound. Enjoy a CRUISE of Milford Sound fjord. With rock faces that rise nearly 4,000 feet on either side, the scenery will take your breath away. Following your cruise return to Queenstown. A free day with several options to choose from – shop in the charming village centre, relax and visit with new friends or enjoy an optional and exhilarating jet boat ride on the Shotover River. Or perhaps you will join the optional “Gold Seeker – Metal and Movie Discovery” tour which takes you through the majestic Remarkables mountain range and the breathtaking Queenstown countryside showcasing many of the locales where The Lord of the Rings movies were filmed. Meals Include: Breakfast. Begin your day with a visit to the beautiful 19th-century gold rush settlement of Arrowtown, a boomtown during the 1860s gold fever. Next, sample the freshness of the Central Otago region with a stop at a local fruit stand. Later, arrive at MOUNT COOK NATIONAL PARK where you can take a nature walk or enjoy an optional flightseeing tour (weather permitting), a great way to appreciate the top of New Zealand’s highest mountain range. Meals Include: Breakfast, Dinner. As you return to Christchurch this morning, pay a visit to Willowbank Wildlife Reserve. A leader in conservation of New Zealand species, Willowbank offers the chance to view New Zealand’s “Big 5” (Kiwi, Tuatara, Takahe, Kaka and Kea) up close and personal. Meals Include: Breakfast, Dinner. Depart for home with pleasant memories of your Australia and New Zealand adventure. Meals Include: Breakfast.